www.photomacrography.net :: View topic - Gee, do you suppose I should have mentioned the sharpening? Gee, do you suppose I should have mentioned the sharpening? Posted: Thu Mar 29, 2007 8:30 pm Post subject: Gee, do you suppose I should have mentioned the sharpening? I received the November 2000 issue of Reader's Digest. 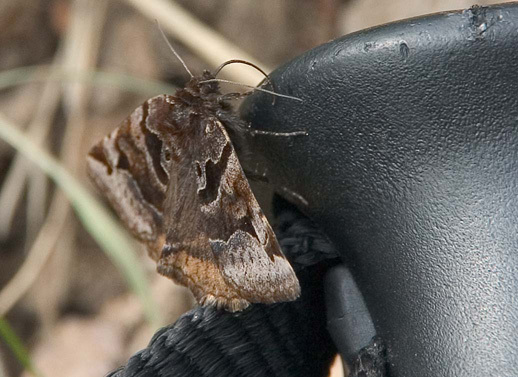 Turning it over, I was delighted to see that the rear cover held a photograph featuring a beautiful Lepidopteran, sitting on a hiker's boot in lovely wild terrain. It was accompanied by a moving and thoughtful caption -- something about the "rugged power of the Rio Grande" contrasting with "an ephemeral butterfly" "poised for a fleeting moment". on the back cover of the November issue are moving and sensitive. write-up are also pretty amusing to readers with a certain background. polyphemus), one of our largest and showiest native silkmoths. hiding place where they can fold their wings. It's lovely. It's hilarious. Thank you! Fortunately, the folks at Reader's Digest thought it was pretty hilarious too. They chatted with me, and with the photographer, and then in a high spirit of good humor they published my whole letter, a reproduction of the image, and a reply from the photographer explaining that it was a "mystery" how the moth came to be on the hiker's boot, and that this was "art, not science". I could not possibly agree more! Disclosure: The image posted above is actually a 4-frame (2x2) stitched panorama, overlaid by a carefully masked image of my legs, boots, and a pinned moth, with the pin cloned out of the moth and numerous contrails cloned out of the sky. 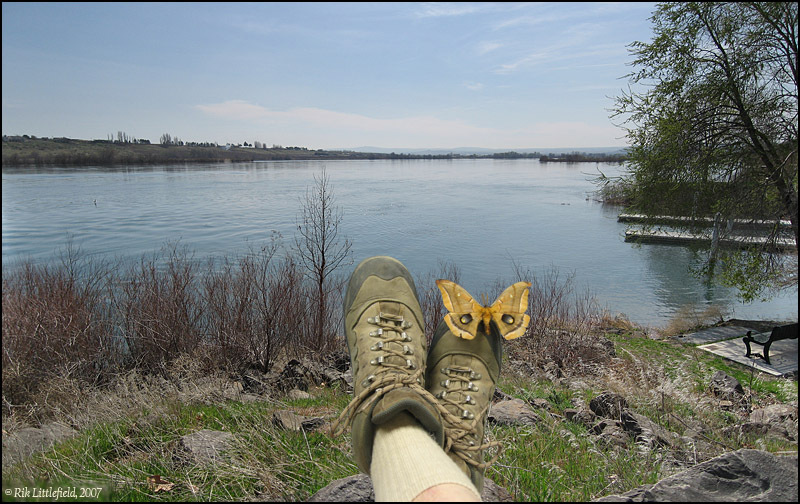 Neither the river, the sky, the boots, nor the moth, ever actually looked quite like this. Thanks for pointing this out, Rik. It is amusing to see us get all worked up over USM (or whatever), and others publish whoppers like this. Of course, he DID publish his whopper on the cover of Reader's Digest.....Hey, where's my insect collection?! It must have been the "emotional" truth. A good catch. My favorie past time is catching "false" moons in photos. You would be surprised how many full moons appear where they can't. I even saw one at the Pentax photo salon in Tokyo majestically floating above a seascape. It was big and clear. The photograpger just shouldn't have used an image of an overcast night in which to place it. Other impossibilities are full moons over a horizon where the sun is setting and very large full moons - the angular size of the moon is constant and does not change with the distance to the horizon. All the best Rik, interesting reading thanks M8t. Nice to see someone actually doing something about it. Umm, yeah. There was some more follow-up that was both amusing and confusing, as well. As background, you need to know that I've been a member of the Lepidopterists' Society since 1968 or so, and I included that fact as part of my signature in my letter to Reader's Digest. Well... A couple of months after Reader's Digest published my letter, I got praised by the editor of the Lepidopterists' Society newsletter, for having kept Reader's Digest honest about moths versus butterflies. Then in the following issue of the Lep Soc newsletter, I got chastised for inappropriate precision, by somebody who had not seen either the original Reader's Digest cover, or RD's publication of my letter, but was only responding to the third party (or was it fourth?) praise in the Lep Soc newsletter. Fortunately, an email to that person cleared up that bit of confusion, and they joined in the amusement. The difference...is that a butterfly is not a moth! In my experience, there is no problem at all with the concept of a (generic) day-flying moth seeking salt on a convenient boot. The problem was only in the details. The particular moth featured by Reader's Digest does not behave as shown, and that tipped me off that the "ephemeral butterfly" "poised for a fleeting moment" was actually a dried corpse, fastened rigidly to a boot! I took away two lessons from the experience. 1. If you fake something, be prepared to get caught. 2. If you speak up, expect to be misunderstood. Neither lesson has ever disappointed me. I do remember reading about a National Geographic cover coming under fire years ago (I woud have to guess before digital) where the Egyptian pyramids were moved closer to each other so two of them could fit on the cover together and someone caught it, not sure what happened. I remember another flap involving a herd of zebras, many of whom looked too much like each other. I can't find the reference to that, however. What I find interesting is that Clark makes a sharp distinction between animals and everything else. "Any images with digitally placed animals will be labeled as such". On the other hand, "blurred components can be replaced with sharper images of the same thing" without comment. This sounds completely different from opinions expressed in this forum, for example that all stacking has to be declared. I wonder if there's some underlying principle that's the same in both cases?